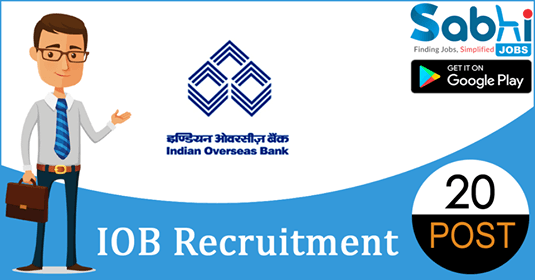 IOB recruitment 2018-19 notification has been released on official website www.iob.in for the recruitment of 20 vacancies at Indian Overseas Bank. The candidate who is looking for Manager (Information Security), Senior Manager (Information Security) & Various Vacancies can apply online application from 21st July 2018 and before 4th August 2018. Qualification B.E. / B. Tech Degree or Post Graduate Degree in Computer Science/ Computer Technology/ Computer Science & Engineering/ Information Technology/ Electronics & Communication/ Information Security/ Cyber Security with minimum 60% marks* or equivalent Grade or First Class. Selection Process Selection will be based on Online Examination and Interview. How to Apply Interested and eligible candidates may apply online application form at official website www.iob.in from 21st July 2018 to 4th August 2018. Candidates are required to apply only ‘ONLINE‟ through Bank‟s website. Any other form of application shall not be entertained. Incomplete applications / Applications without supporting documents will be rejected outright. In case of candidates uploading more than one application for any reason, the latest registered application will only be considered. Only Candidates willing to serve anywhere in India and willing to work in shift basis (24*7*365) should apply. Before applying, the candidates must ensure that he/she fulfills all the eligibility criteria and other norms mentioned in the advertisement and has in his/her possession the requisite documents and certificates specified by the Bank, and that the particulars furnished in the Online application are true and correct in all respects. Mere calling for applications for the Interview shall not imply that the Bank has been satisfied beyond doubt about the candidate‟s eligibility. Bank has the right to cancel candidature at any stage if found that he/she is not fulfilling the eligibility criteria and /or that he/she has furnished any incorrect/false information/certificate/documents or has suppressed any material fact(s). If any of these shortcomings are detected even after appointment his/her services are liable to be terminated. The Bank is free to reject any application, at any stage of the recruitment process, if the candidate is found ineligible for the post. The decision of the Bank in any matter relating to recruitment at all the stages of the recruitment process will be final and binding upon the candidate. No correspondence or personal queries in this regard shall be entertained by the Bank. All candidates called for Interview, will have to produce originals as well as self-attested photocopies of the prescribed certificates in support of their educational qualification, experience, date of birth, caste, etc. The candidates belonging to SC/ST/OBC/PC Category are required to submit originals as well as self-attested photocopies of their caste certificate/certificate of disability issued by the competent authority, in addition to the other certificates in support of their eligibility criteria. In case of candidates belonging to OBC category, the certificate inter-alia must specify that the candidate does not belong to “CREAMY LAYER” section excluded from the benefits of reservations for OBCs in Civil Post and Services under Government of India. The OBC certificate containing “Non Creamy Layer Clause” in Central Government format, should be valid as on the last date of online registration i.e. 04.08.2018 (issued within one year prior to the last date for online registration). Candidates belonging to OBC category but coming under Creamy Layer are not entitled for OBC reservation. They should indicate their category as General in the online application form. Candidates serving in Government /Quasi Government Offices/Public Sector Undertakings including Nationalised Bank, Financial Institutions will be required to produce Original “No Objection Certificate” from the employer at the time of interview, failing which the candidature may not be considered. Candidates belonging to reserved category, including Physically Challenged category, for which no reservation has been announced, are free to apply for vacancies announced for General category, provided they fulfill all the eligibility criteria. Candidates who do not satisfy the eligibility criteria and who do not produce (for any reason) the originals as well as attested photocopies of all documents required to be submitted as advised in this notification and Interview call letter, whomsoever, shall not be permitted to attend the Interview, even though they have been called for Interview. The candidates will have to appear for interview at their own expense. However, outstation eligible SC/ST/PC candidates who are not employed and attending the interview will be reimbursed to and fro second-class ordinary train fare by the shortest route on production of evidence of travel (as per extant Govt. Guidelines). The Bank will not be responsible for any injury / losses, etc. of any nature. Any request for change of address/ e-mail id for communication will NOT be entertained. Appointment of selected candidates is subject to their being declared medically fit as per the requirements of the Bank. Such appointment will also be subject to the Service and Conduct Rules of the Bank. In case of any dispute on account of interpretation in any version other than English, the English version shall prevail. Any dispute arising out of this advertisement shall be subject to the sole jurisdiction of courts situated at Chennai.